If there's anything that Castlevania taught me about Bram Stoker's Dracula, it's that Dracula lives in a giant castle that keeps self destructing them popping up again every once in a while. He has to deal with some jerks of neighbors named the Belmonts, and he always has to deal with them coming in and disturbing his guests and wrecking up the place. Plus he has an unruly kid that just doesn't like him very much. It's pretty much the world's darkest sitcom since the Adam's Family. The other thing I learned is that anything Dracula-related has tons of Easter Eggs. Did you know that in every library, there's at least one Dracula novel. If you remove each page one at a time so you're left with an empty cover, there will be a phrase along the inside of the spine you can chant loudly. If done successfully, an angry librarian will spawn behind you and Dragon Punch the back of your head. If you're not in the mood to get Dragon Punched, though, you can always explore the wonderful one-castle world of Symphony of the Night. It has lots of wall chickens and anime references scattered around, so let's get started! Since the PS1 was a CD-based console, a lot of the discs that were created for it were able to be recognized in some CD players—it would show that there were "tracks" there, but nothing would play. That is, of course, unless the game is Symphony of the Night. "As you can see, this is a PlayStation black disc. Cut number one contains computer data, so please, don't play it. But you probably won't listen to me anyway, will you?" A remix of a Castlevania tune begins to play as soon as his dialogue is concluded to reward you for not heeding his instructions. That's sticking it to the man for you. If there's one thing everyone remembers about Symphony of the Night and its platforming was the flying Medusa heads. Any time you wanted to get anywhere in the castle and you were around spikes, you'd be lucky if a wall of heads wasn't flying in your general direction. Any time you got touched by those little blighters you'd turn to stone and take extra damage. There is, of course, always one exception: when you're turned into a giant freaking gargoyle. At random intervals, which are arguably influenced by your Luck stat, whenever Alucard is turned to stone, something strange will happen. Instead of turning in to the mid-flinch stone form of himself, he'll turn into a giant stone gargoyle instead. While in this form, he is immune to all damage. Some people have wondered if this is Alucard's "True Form," as it is monstrous and large just like his father's "True Form." In the Royal Chapel towards the top-right of the area, there is a room with a single confession booth, which contains a chair on the left and right. 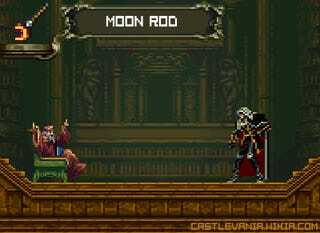 If Alucard sits on the left side, he will take the roll of the confessor. 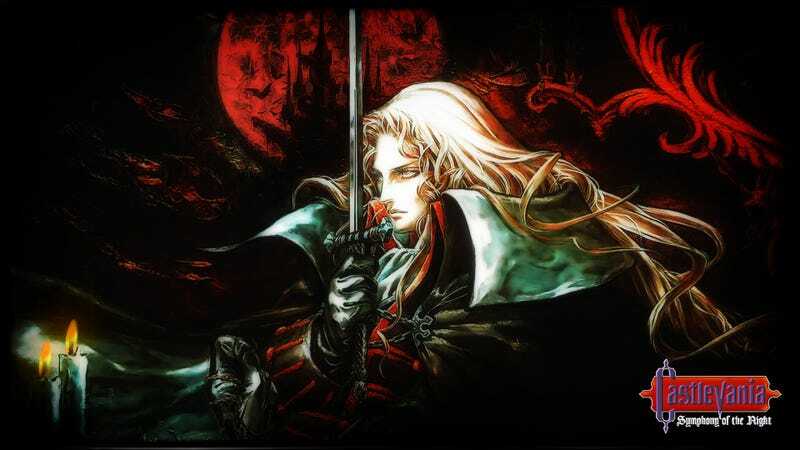 A ghostly priest will come to hear his confessions and will either attack Alucard through the wall or listen to him for a moment before crossing himself and dissipating. He has a random chance to leave behind Grape Juice (which is Wine in the Japanese version). Alucard can also sit on the right side of the confession booth, placing himself in the role of the priest. When he does this, a ghostly woman will appear and either attack Alucard through the wall or weep quietly to herself and gradually fade away. She will not leave behind an item, unlike the Priest. The outcome of the confessions is random, but you can tell what will occur after it starts by the color of the clothing your ghostly partner is wearing. Red clothing is a good indicator that nothing good will come from your exchange. The Rune Sword is one of the rarest items in Symphony in the Night. While it's a very good throwing weapon for Alucard, it only drops off of one enemy in the entire game: the Dodo Bird. On top of that, the drop rate for the item even off of that one creature isn't that great. As a result, not a lot of people have ever picked this weapon up. If you ever do manage to get one, be sure to pay special attention to the trail it leaves as it flies through the air. "Verboten," the German word for "Forbidden" can be seen as gaps in the trail. I guess they really didn't want anyone to get it. There's also a reference to a staple series in the Anime world. One of the magical items that Alucard can get is a Moon Rod, which appears and is even named after the weapon sported by the ever-popular Sailor Moon. It also shoots out silver crescent moons, similar to Sailor Moon's "Moon Scepter Elimination" move. They even leave little sparkles behind as they fly through the air. Sadly, Alucard does not dress up in a magical girl outfit when he has this item equipped. It was a loss that was not taken well by the Magical Schoolvampire community across the globe. If there's one series that Konami is known for other than Castlevania, it has to be Metal Gear. The two games have had a few crossovers in their various iterations, but they tend to be a bit more in-your-face with Metal Gear since the series is notorious for breaking the fourth wall. In fact, during the Psycho Mantis fight in Metal Gear Solid, the PlayStation will scan the memory card that you have inserted during the dialogue for this fight. If the system detects a Castlevania: Symphony of the Night save, Psycho Mantis will ask, "You like Castlevania, don't you?" That's enough for this week, everyone! Check out the Castlevania wiki if you want to find some more Easter Eggs and references scattered throughout the series. If you didn't get your fill of hidden treats, be sure to check out my exploration of the Luigi's Mansion series that was posted last week and be sure to keep an eye out for me next Friday when I return with more tidbits to share! If you enjoyed reading the article above, feel free to contact and follow me on Twitter or check out some of my other articles here.